You might remember the viral video in 2015 from a high school in Columbia, S.C. A white school resource officer confronts a student who is black. He flips her desk on the ground and drags her out of her chair. BEN FIELDS: Put your hands behind your back. Give me your hands. Give me your hands. SIMON: Her teacher had called the officer in the classroom because the student wouldn't give up her cellphone. The incident sparked a nationwide debate about race, discipline and the role of school resource officers. And as Kat Chow of NPR's CODE SWITCH reports, it prompted changes in that South Carolina school district. KAT CHOW, BYLINE: It's 5:30 in the morning on a Monday. Hugh Harmon is helping his daughter get ready for school. HUGH HARMON: You have everything in your bag that you need to take? HARMON: And the permission slip? CHOW: Chai Soleil Harmon is 13 and in the seventh grade. In a couple years, she'll be a freshman at Spring Valley High School. And for her dad, what happened at that high school two years ago still hits close to home. HARMON: If it was my daughter, I would absolutely lost it - my professionalism out the door. Daddy protection would of came out. CHOW: Harmon heads the Black Parents Association of the Richland 2 school district, which includes Spring Valley High. It's a big district - 28,000 students, a majority who are black. Harmon has also worked as a school administrator in a district nearby. Like a lot of parents, when Harmon first saw that video two years ago, he was furious. It got to something he and the Black Parents Association had tough questions about for a long time, questions about discipline and race in the Richland 2 school district and the role of school resource officers. HARMON: Is he a school police officer, or is he a resource, as the name suggests? Is he there policing the kids, or is he there to protect the kids? CHOW: Good questions - and for answers, I turned to Leon Lott, the Richland County sheriff for more than two decades. LEON LOTT: Well, they have many hats. That's why they're called a resource officer. CHOW: Lott explained to me how his department uses SROs. As in many other places around the country, SROs are deputized officers assigned to a school. And Lott says they have all kinds of roles as they walk the halls. LOTT: Educator, protector, counselor - a little bit of everything that's needed to build a relationship with our young people. CHOW: And of course, they enforce the law and make arrests if necessary. But there's one thing Lott says his SROs do not do - discipline. FIELDS: Put your hands behind your back. Give me your hands. CHOW: Lott told journalists in 2015 that watching that Spring Valley video - it made him want to, quote, "throw up." He fired the officer involved. And Sheriff Lott tells me now, what happened two years ago was a turning point for how people in his department, the district and all across the country think about discipline in schools. Though the Richland 2 school district still has school resource officers, Lott says another thing needs to change, a state law that dates back to 1919. CHOW: The Disturbing Schools Law was meant to protect students at girls' schools from obnoxious behavior from outside agitators, like flirting boys. Over the years, it was used for all kinds of things. LOTT: Just us sitting here right now - if you're chewing gum and I told you to take the gum out and we're in a classroom and you don't take it out, you could be arrested for disturbing school. JOSH GUPTA-KAGAN: There's a disproportionate number of African-American kids who are affected by this statute. CHOW: That's Josh Gupta-Kagan. He is an assistant professor of law at the University of South Carolina. 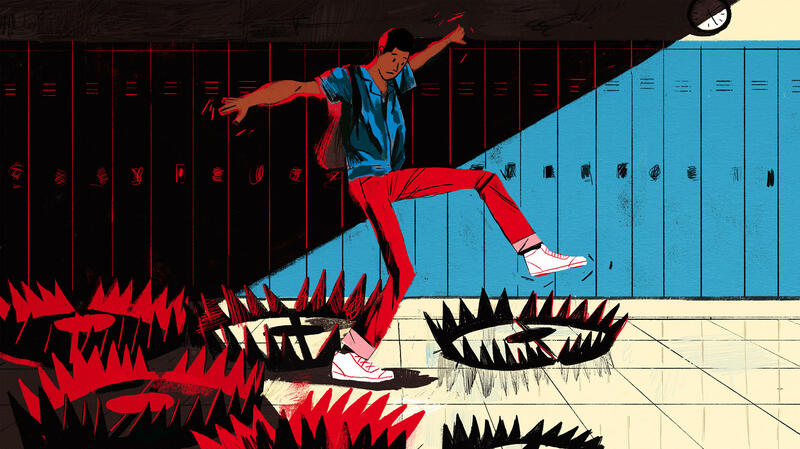 GUPTA-KAGAN: So if you've got a kid who is black, there's a decent amount of research that shows that good, well-intentioned, not overtly racist people will look at that situation and judge it to be more threatening if it involves black kids. CHOW: And some of that research includes a recent report from Georgetown University. It shows that black girls are more than two and a half times more likely to be referred to SORs than their white classmates. And they're almost four times as likely to get arrested in schools. Here in Columbia, S.C., the school district says that over the past few years suspensions and expulsions are down overall, and enrollment is up. And everyone says they learned a lot from that video two years ago and want to move on. HELEN GRANT: That was a very isolated event. CHOW: That's Helen Grant the district's chief diversity officer. She says that school resource officers know that their role is to address criminal misconduct. GRANT: We're hoping that our students become such good citizens that they are not participating in any criminal misconduct so that students would not need to come into contact with the school resource officer. CHOW: Hugh Harmon and the other members of the Black Parents Association want their kids to be good citizens, too, except their worry isn't just about how their kids behave. It's about how they're treated. Kat Chow, NPR News. (SOUNDBITE OF AKIRA KOSEMURA'S "GRASSLAND") Transcript provided by NPR, Copyright NPR.